Parenting the Climate-Change Generation Or Will They Parent Us? Kids are taking over the streets in other countries, rallying and chanting and refusing to go to school one day a week. Young people across the world are striking to draw attention to the ravages of climate change. They are demanding — with their bodies and their voices — that the catastrophe each of them will inherit be a priority for the grown-ups around them. They are insisting that we adults make some sacrifices to keep their planet from becoming uninhabitable. “We are the voiceless future of humanity… We will not accept a life in fear and devastation. We have the right to live our dreams and hopes.” You know who said that? A teenager. Actually, lots of them, since it’s part of a letter, a call to action, from the organizers of Fridays for a Future. I’m hearing them loud and clear and it’s driving me crazy! The map of activities that those teenagers planned for their March 15th global day of action represented a mind-popping collection of locations, including Tromso, Norway; Port Louis, Mauritius; Diliman, the Philippines; Osorno, Chile; Whitehorse, Canada; Bamako, Mali; and Tehran, Iran. You don’t have to be a cartographer to notice that there are way more actions planned around the world than in Donald Trump’s United States. This clarion call comes from teenagers, the crew we characterize here in America as eye-rolling creatures suspended in a helpless state of consumerism, hyper-sexualization, and crushing academic pressure. 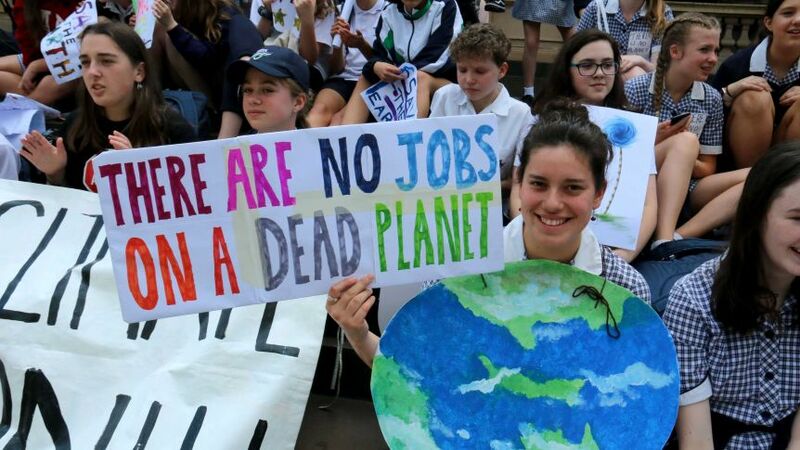 Of course, there are kids in the streets (and sitting in at congressional offices) for climate change (and for a host of other issues) here, too, but, there are far more doing nothing but playing Fortnite on their phones or tablets and uploading DIY lip-balm videos on YouTube. Seventy-three percent of Americans now acknowledge the reality of human-caused climate change — by far the biggest number since the question was first asked in 2008 — but too few want to pay to make it go away. Asked if they’d spend even $10 a month to address the crisis, 72% of Americans took a hard pass, 57% of them opting for $1 a month instead. Set that against the cost of your favorite large iced latte with a shot of caramel, a Netflix subscription, or the Uber ride you summoned when you could have walked. Time for another latte, folks, because this is our problem, whether we’re facing it or not. How Do We Parent Generation Hot? On a good day, I quip that “I’m halfway to 90.” On a bad day, I can’t imagine what the world will look like in 2064, for me or them. I was named for my paternal grandmother, Frida. Born in 1886 in the Black Forest of Germany, she emigrated here with her family when she was very young, grew up in Minnesota, and married my grandfather in June 1911. I was married exactly a century later. I wear her wedding ring, a battered little gold band that connects me to a woman who died before I turned two. The world she bore six sons into wasn’t an easy one. She spent a lot of her time washing laundry, mending clothes, tending crops, caring for animals, preparing food, and raising children, a life I can romanticize the heck out of in the right mood. Had she been able to leave her small world and travel into my future, so much of my daily life would undoubtedly be a marvel, a mystery, or a concern to her. I suspect, for example, that the hours I sit in front of this computer wouldn’t even look like work to Grandma Frida. And if I could fast-forward 45 years into the future, what would I see? On the marvels and mysteries, I haven’t a clue, but I do know one thing: I would certainly see an extreme version of today when it comes to climate change. In other words, the indiscriminate damage from extreme weather, hitting vulnerable populations particularly hard, will only have intensified dramatically. After all, 2018, the wettest year in America in 35 years, saw 14 weather catastrophes, each of which cost a billion or more dollars. It was also the fourth-hottest year on record for the planet as a whole (the other three being the previous three years), according to data tracked by NASA and the National Oceanic and Atmospheric Administration. The latest United Nations Intergovernmental Panel on Climate Change reportonly predicts more and far worse of what we have already been seeing: droughts, floods, rising sea levels and heat indices, increasingly fierce wildfires, more food shortages and famines to come, and ever larger populations on the move as people flee the weather and the destruction, look for food and shelter, and try to escape the manmade conflicts fueled by such events. That’s Rosena’s future I’m writing about, and Seamus’s and Madeline’s, too. I’ve been making a concerted effort as a parent of small children and an almost-teenager, as a citizen of the United States, and as an environmentalist (or at least someone who would like to wear that mantle) to face my own denial reflex on climate change. Until now, thanks in part to my own parents, I’ve spent most of my life worrying about nuclear weapons destroying the planet. So maybe it’s just a matter of layering one world-destroying phenomenon on another. The strange thing is that I find it easier to think about nuclear war than climate change. After all, when it comes to those nukes, either the button gets pushed or it doesn’t. A finite number of nuclear warheads exist on this planet and they could be dismantled one by one in a relatively short period of time if policymakers chose to do so. The genie could potentially be put back in the bottle. Climate change is another matter. Oh, and talking to my kids about it? That’s a terrifying thought. They’re already deeply afraid of volcanoes for no reason whatsoever. Going to Chicago for a wedding? First question: “Are there volcanoes there?” A weekend trip to New York: “Wait, mom, volcanoes in New York? No, right?” Now, imagine introducing them to the human-made, carbonized version of volcanoes that will actually impact their future. I’d rather not, but I’m thinking I must. That, I suppose, is the work of parenting in 2019. Rosena has a few months more before she becomes a teenager and there is not (yet) a lot of eye-rolling in our household. Thankfully, she remains more kid than adult wannabe on the cusp of womanhood. But the climate-change kids have me thinking harder about her and the fate of her earth. I’m thinking she should know more than she does about the mess the baby boomers got her into. But who or what is really to blame for all of this, anyway? The Industrial Revolution? The war machine? Big Oil? When you’re talking about a staggering 1.5 to 2 (or even 4) degree Celsius increase in global temperatures, I suppose there’s bound to be plenty of blame to spread around. My husband and I bug Rosena for taking long showers and for her urge to turn on every light in the house. We make her walk to and from school and try to walk as a family as much as possible. We point out how much of what she loves to buy is packaged in non-recyclable, landfill-clogging insta-garbage. We joke that slime is the cause of icebergs melting, bee colony collapse, and every other ill in the world, but we haven’t yet started harping on global warming, greenhouse gases, rising sea levels, and extreme weather events. For a while, I hesitated, not wanting to worry her pointlessly. But there is a point to worrying! As I’ve watched the next generation pour into the streets, I’ve been rethinking things. I’ve started to feel that our family needs to be learning all of this together. It needs to be united in the fight against climate change and in the preparations for a very different future, for Rosena’s future. After my own version of a survey of the recent literature, here’s what I know: we’re screwed. Where do you go from that version of “best case”? Is there such a thing as productive panic? David Wallace-Wells still thinks so. Turning towards this catastrophe is hard work. Here’s just a sampling of the titles of recent books about climate change: The End of Ice: Bearing Witness and Finding Meaning in the Path of Climate Disruption; Field Notes from a Catastrophe: Man, Nature, and Climate Change; Storms of My Grandchildren:The Truth About the Coming Climate Catastrophe and Our Last Chance to Save Humanity; The Great Derangement: Climate Change and the Unthinkable; and This Is the Way the World Ends: How Droughts and Die-offs, Heat Waves and Hurricanes Are Converging on America. You get the idea. No wonder I struggle with what to do with all this information, this mixture of artful alarmism and sober grappling with the facts on the ground. I’m sure Greta Thunberg would be impatient with my waffling and indecision, my fervent wish that this would all just go away. She was 15 years old when she sat down outside the Swedish parliament and “school striked for the climate.” She was inspired by the young people of Marjory Stoneman Douglas High School in Parkland, Florida, who began organizing a true gun control movement after 17 of their schoolmates and staff were killed by a mass shooter. She was motivated by her understanding of the existential threat posed by a warming world, driven to action by her observation that none of the adults with the power to change the rules were doing anything. That includes me, doesn’t it? And I’m all for it. Every single word, even the ones that are being denounced as too expensive, unrealistic, challenging, and anti-corporate. And I’m even more for the new conversation this wave of climate concern is catalyzing. One of these days, we might even have an actual national debate about what it will take to arrest the increases in global temperature that could lead to the demise not of the planet itself, but possibly of human civilization. The fact that many of us still look at the possible cataclysm to come through a distracting everything-is-fine vision of America makes that conversation all the harder. Here in Connecticut, for instance, gas is still only $2.39 a gallon, the local Stop and Shop has three-for-one pints of blueberries from Peru or Chile on offer, and on a recent wintry Friday it was almost 50 degrees. It can be hard to tap into one’s sense of urgency living here in the northeast. And yet we are not immune. Our library hosted an event on city trees at the end of January and I learned that New London’s six square urban miles had lost more than 1,000 trees in the last 10 years. They’ve been cut down after storm damage, removed for new sidewalks, died of old age and of the hard life of a tree living at the street’s edge. A college senior who had counted all the city’s trees and assessed their health told us about how they filter pollutants while offering shade. My community is organizing to get those trees back (and plant even more of them), but we’ll probably fall a few short of the 1.2 trillion new trees that one recent study suggests would be needed to cancel a decade of carbon dioxide emissions. Like all the other homeowners in New London, I now find a $15 stormwater surcharge on the water bill that arrives every quarter. It’s not quite the $10 a month climate change tax Americans were polled on, but it is related to a warming world and it’s hitting some of my neighbors pretty hard. Our community, after all, is bordered on three sides by water and (like increasing numbers of American communities) our water infrastructure is antiquated. It gets overwhelmed by even a modest downpour. We’re not talking about Miami-level sunny-day flooding, but we could get there and, if so, it will probably take a lot more than $60 a year to keep us reasonably safe. Southeastern Connecticut isn’t on the front lines of climate change. Ours are still third- or fourth-level problems related to a warming, more resource-pinched world. Our community probably won’t be uninhabitable in the next generation. Our home is likely to withstand the next round of mega-storms. Still, we are all beginning to pay for climate change, even if the costs and consequences have yet to fully register. Taken individually in New London (if not Puerto Rico or Houston), it’s been a matter of minor inconveniences and background noise, little more than so many phantom twinges. Still, I have no doubt that we’re in trouble. Trouble deep. And I’m not going to lie to my kids. I’m not going to deny that I’m terrified about their future. I’m not going to fail as an adult. I still have work to do. I can still do my small part to help the school strikers and the members of Generation Hot who have identified the “right to live our dreams and hopes” as a right worth defending. I’m not going to fail as a parent. I’m already listening to the school strikers, many just a few years older than Rosena. I’m going to heed their leadership. I plan to join them, to learn and listen, to do my best to share my still unarticulatable fears and, with my children, to face this future together.